It is a known fact that men inherit both Y and X chromosomes while women only X chromosomes. As a corollary of that fact we also know that Y-chromosomes, sometimes synonymized with Y-DNA, are only inherited by the male part of the human race. 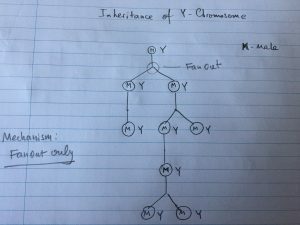 This means that Y-chromosome inheritance mechanism is only forward-branching, i.e. Y-DNA is passed from one generation to the next generation “nearly” unchanged. As I am not an expert in genetics I cannot state precisely, in quantitative terms, what this “nearly” is worth. Suppose this “nearly” is close to 100% for simplicity. 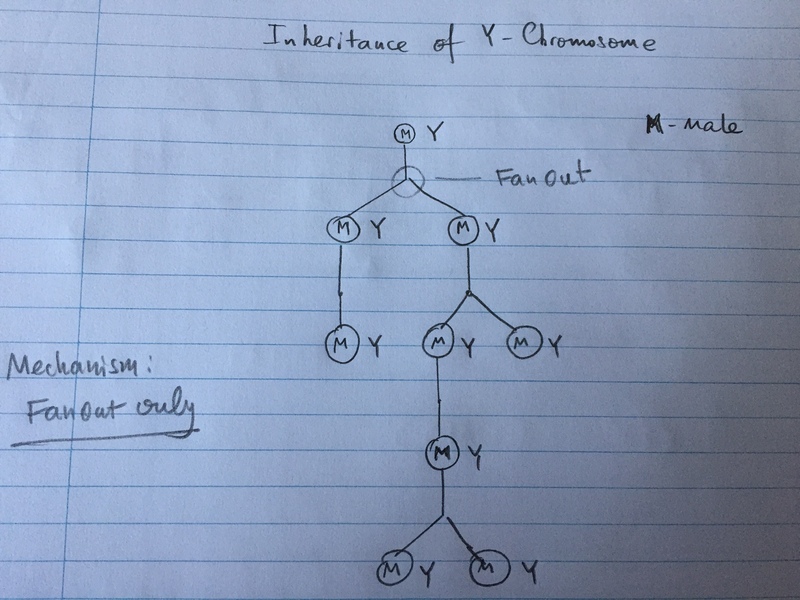 Below is a diagram which illustrates my understanding of the mechanism of inheritance of Y-chromosomes. This diagram is basically a branching tree, showing the pathways of the Y-DNA from one generation to the future generations of males. 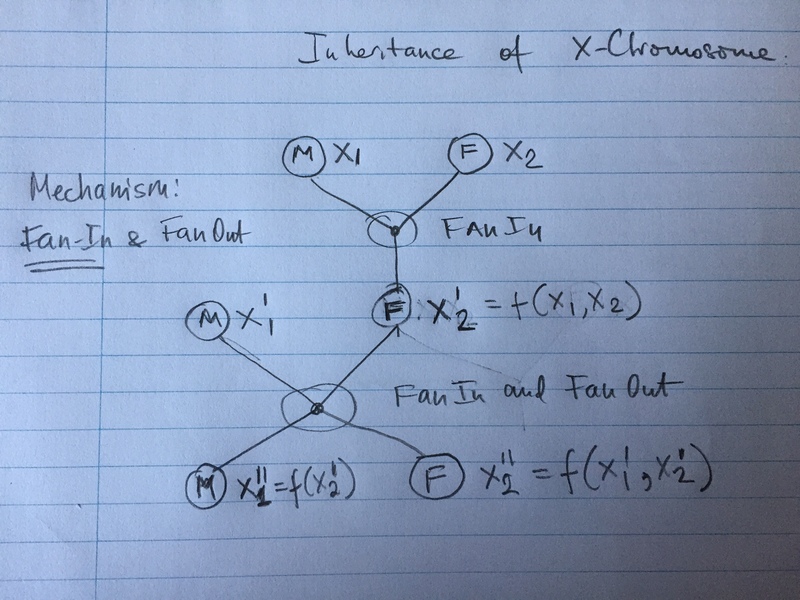 The characteristic feature of this inheritance mechanism is that it is Fan-out only. Namely, there is no way that the Y-DNA can be obtained by merging different Y-DNAs because we have no Fan-in mechanism. Let’s now consider the mechanism of inheritance and evolution of X-chromosomes.The way how I see this mechanism is shown in the following diagram. X-chromosomes are inherited by both males and females. But, as I understand, this happens in two different ways. Each female takes a portion of X chromosomes from her father (let’s denote it as X1) and a portion of X chromosomes from her mother (denoted by X2), thereby producing its own set of chromosomes X2’ which is a function of X1 and X2. Similar inheritance is in the next generation where X2’’=f(X1’,X2’). Each male, however, only inherits X chromosomes from his mother, as shown above, where X1’’=f(X2’). At each generation, when the offspring produced has a female, there is a merge of X chromosomes from both parents. This means that the pool of X chromosomes as we go down the generations is constantly changed and renewed with new DNA from different incoming branches. 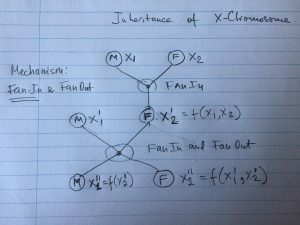 This mechanism is therefore both Fan-in and Fan-out. And this is not a tree but a directed acyclic graph. What sort of conclusion can we draw from this analysis? Well, I draw many interesting (to me at least) conclusions associated with the dynamics of evolution of the genetic pool of males and females. One can clearly see that the dynamics of genesis of females is much higher than that of males. Basically, one half of a male’s genesis remains “nearly” (please note my earlier remark about “nearly”) unchanged, and only the other half is subject to mutation, whereas in females both halves are changed. I can only guess that Y-chromosomes are probably affected by various factors such as geographical movements, difference in environment, deceases etc., but these mutations are nowhere near as powerful as the mergers in the X-pool. In my next memo I will write about the relationship between the above mechanisms of evolution and PID (proportional-integrative-differential) control in dynamical systems, which will lead to some conjectures about the feedback control mechanisms in evolution of species. I would be grateful if those whose knowledge of human genetics is credible enough could report to me of any errors in my interpretation of these mechanisms. in collaboration with Newcastle’s Computing Science colleagues, as well as with the teams from Imperial College and Southampton Universities (under PRiME project – http://www.prime-project.org) , has published a visionary paper in IEEE Computer on how to analyse the interplay between performance, energy and reliability of computing systems with increasing number of processor cores. A very interesting workshop was held in my Alma Mater (LETI – Electrotechnical Universrity) in Saint Petersburg, Russia on 4-8 July 2017. The workshop contained lots of interesting presentations – largely from industry and largely on modelling and empirical measurements of the EM interference in microsystems and ICs. Basically, the problem of reuse and block replacement is huge due to the unpredictability of the EM effects between components on PCB and on chip.